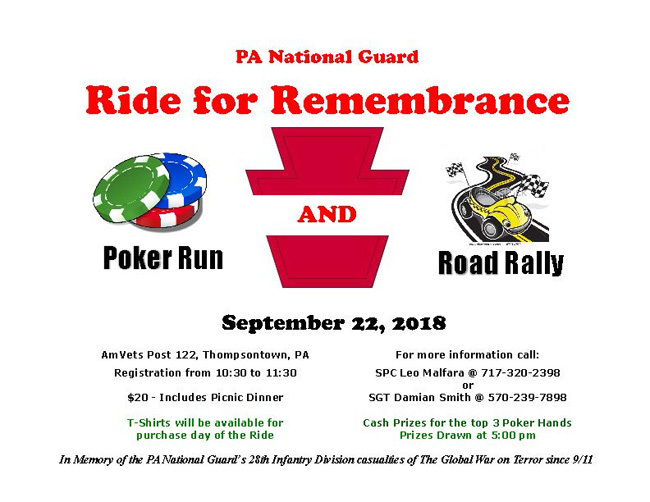 The annual Ride for Remembrance is held in memory of all the casualties of the War on Terror since 9/11 and benefits the 28th Infantry Division Association Memorial Fund. The 28th Infantry Division Association supports memorials honoring the division and assists in their maintenance to the extent possible. The Memorial Fund is a special purpose fund designated for monument projects that are approved by the Executive Council. This includes purchase, restoration, or repairs of monuments that honor the 28th Infantry Division or its regiments. Any monument across the Commonwealth can be seen as a worthy project. This memorial endowment can also be remembered in estate planning to be assured that charitable gifts will be used in accordance with the donor's philanthropic wishes. The 28th Infantry Division Association is a non-profit 501(c)(3) organization. We are an all volunteer organization with 100% of the funds going to the fund to which the donation was made.